Civic Events and Festivals | Michael P. Wasserman, Inc. The Boston Arts Festival, the city’s opportunity to share its amazing array of visual and performing artists, features the work of more than 70 of the area’s leading artists and also includes continuous entertainment on two outdoor stages at Christopher Columbus Park. “Michael and Chris have become true partners in ahts: The Boston Arts Festival. They are as committed to producing a top tier festival as we are here at the Office of Arts, Tourism and Special Events. Their experience and professionalism have taken the event to a whole new level." 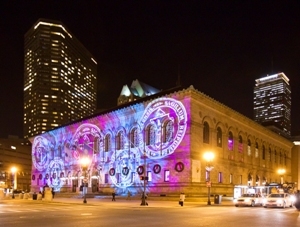 MPWI partnered with the Rose Fitzgerald Kennedy Greenway Conservancy on the Inaugural Celebration of the Greenway in October, 2008. The day included the dedication of the Mother’s Walk, a carousel, Ferris wheel, three stages, an outdoor movie screen and continuous activities along the entire 2 ½ mile Greenway. Governor Deval Patrick’s 2nd Inaugural Celebration was held in January, 2011 at the Boston Public Library in Copley Square. 1500 guests sampled refreshments representing various counties from across the state in each of the Library’s rooms, where different entertainment and decor created distinct atmospheres – from a Jazz Lounge in the Abbey Room to Swing Band dancing in the Changing Exhibits Room. The event was intimate, captivating and unique. When President Barack Obama visited Boston in May, 2011, MPWI managed the Obama for America event at the Boston Center for the Arts Cyclorama. Joining the President on the speaking program were basketball legend Bill Russell, Celtic’s star Ray Allen, and Governor Deval Patrick. MPWI coordinated all aspects of this event working with the campaign staff, Governor’s staff, US Secret Service, and state and local police. © 2019 Michael P. Wasserman, Inc..